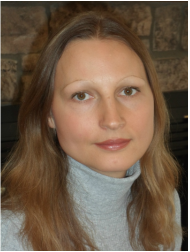 Yulia Rirdan is a nutritional consultant and herbalist. She immigrated to the United States from Russia over a decade ago, where she married and eventually moved to Colorado. She studied cutting-edge clinical nutrition and medical herbalism at the reputable North American Institute of Medical Herbalism (NAIMH) in Boulder, Colorado. She then finalized her education at the Global College of Natural Medicine, which familiarized her with more standard approaches. Yulia’s passion for healing illness through nutrition is founded in her own long-term health issues as an adult. Originally from the Arctic Circle in northern Siberia, she grew up with a strong connection to nature. Her father would often take her into the wilderness to ice-fish, hunt, pick wild mushrooms and berries, and scramble up mountains in search of Golden Root (Rhodiola rosea, a powerful immune-boosting herb native to the area). Unfortunately, as a child Yulia’s diet was high in sugar and white flour. Although her mother was a good cook and they always had a kitchen full of nourishing food, she also consumed many sugary sweets. Yulia’s mother was a nurse practitioner, and as was common at the time, Yulia also routinely received antibiotics for illnesses she suffered from. As she would later discover, this combination of a high sugar diet and frequent antibiotic use would have disastrous, long-term consequences on her health. At the age of 26, Yulia was diagnosed with two “incurable” autoimmune conditions: interstitial cystitis, a very painful bladder condition, and psoriasis. She additionally suffered from migraines, chronic vaginal yeast infections and a chronic sore throat. Despite countless visits to well-known medical urologists, some of them “holistically minded”, conventional medicine could provide no answers as to why Yulia had developed autoimmune disease. She was told she needed to prepare herself for an inevitable lifetime of suffering. Additionally, Yulia’s two children also suffered from serious health issues. Her young son suffered from severe eczema that began at three months of age, a condition so painful he was forced to toilet train at 10 months because he was unable to wear diapers. Her daughter developed “silent” ear infections that led to a build up of thick fluid in her ears, affecting her hearing. Doctors advised immediate surgery to install ear tubes, and remove her enlarged tonsils and adenoids. Influenced by her childhood connection to nature, or perhaps guided by her fierce motherly instinct to protect her children from amputative surgeries and suppressive medication, her intuition guided her NOT to take current medical advice. At this crisis point, Yulia finally turned to nutrition as the very foundation of health. She instinctively felt that the body did have the power to inherently cure itself, given the right components. Step by step, as she cumulatively gained knowledge through her nutritional programs, she was able to completely clear her “incurable” interstitial cystitis, psoriasis, vaginal yeast and chronic sore throat. By eliminating grains, starchy vegetables, sugars and sweet food, and emphasizing a diet of hormone and antibiotic free meats, organ meats, bone broths, wild caught fish, green vegetables, soups and stews, healthy fats, nuts, seeds, and low glycemic fruit and berries, Yulia regained her health. By completely changing her diet, her body was able to fully restore itself in less than a year. As she turned her attention to her children, she discovered her daughter’s ear infections and “partial hearing loss” was in fact a dairy allergy. Off of dairy, these symptoms completely disappeared within one month. Similarly, her son’s eczema turned out to be due to multiple food allergies. Through a natural process of elimination far more effective than any laboratory allergy test, the troublesome foods were removed from his diet, leading to complete resolution of his eczema and prevention of more serious progressions that often occur. Yulia’s own affliction with acute migraines vanished with the elimination of her own food allergens. These personal experiences with the power of nutrition in healing deep and chronic health imbalances have led Yulia to a true passion to help others. Yulia lives with her husband and two children in Lafayette, CO.
​Yulia is an avid martial artist, with a black belt in taekwondo, and a brown belt in American free style karate.